Many readers have written in praise of Rudolf Kempe after reading my post Great recordings without the spin. Among them is Alex Ross who writes 'His R. Strauss, too, is unsurpassed, perhaps unequaled'. To continue the Kempe thread I am featuring two of his many recordings in my collection. Sleeve's featuring photographs of him are rare. Above is an early CD re-issue of his peerless disc of the Strauss concertos; it does feature an artist photo but is marred by EMI's crassly insensitive typography and logo. 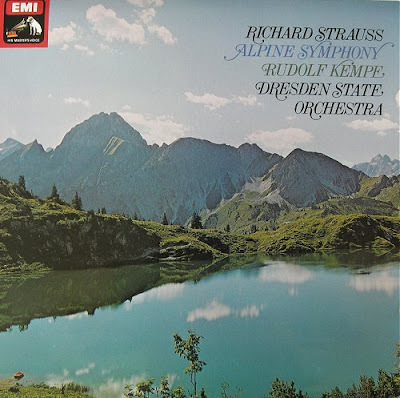 Below is my 1973 LP of the Alpine Symphony with its subtle graphics but typical for the period library photo; my 'first edition' disc is, incidentally, encoded in SQ Quadraphonic sound meaning that a multi-channel release (SACD?) would be possible. Unmissable music making as Kempe's blazing interpretation of Strauss' unquiet thoughts melts the hoar frost of musical routine. Ulf Hoelscher also recorded, I believe it was the first one as well, Korngold’s Violin Concerto! David, surely Heifetz's 1954 recording of Korngold's Violin Concerto was the first, with Alfred Wallenstein and the Los Angeles Philharmonic? I have the RCA LP in front of me. The cover photo makes Heifetz look like Bing Crosby! The coupling is Bruch's Scottish Fantasia with Sargent and a London studio orchestra. Yes, I forgot about the Heifetz! Great recording, as is his recording of the Rosza Violin Concerto, and the Waxman Carmen Fantasy. Isn't that just because the size/ format of an LP cover allows for far greater space? When original covers have been reduced in the past the result often looks "mean". 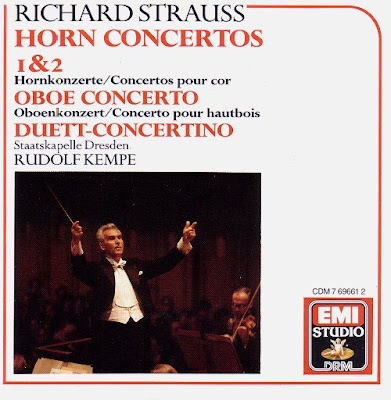 Nick, I don't think the Strauss Concerto's CD artwork was reduced from the LP (look at that logo!) - it was a re-work for the new format. In fairness to EMI (if that is possible), that sleeve comes from a particularly bad period of graphic design. It is from the early days of CD when everyone was grappling with how to make the smaller size of sleeve work in visual terms. That particular CD design has long gone; to be replaced by a bland 'wall-paper' motif.